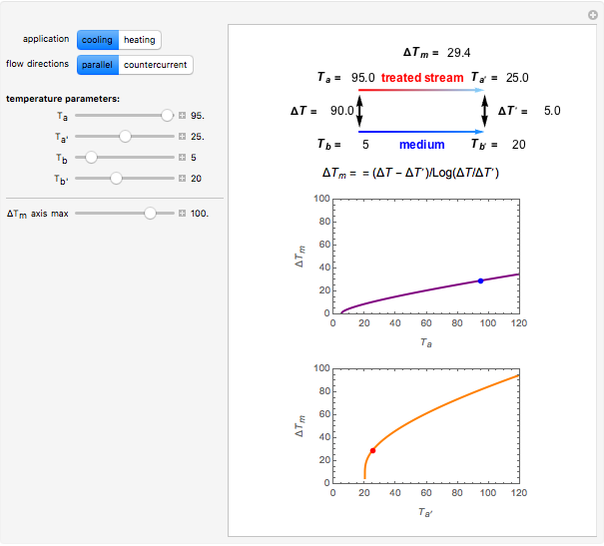 This Demonstration calculates and plots the logarithmic mean temperature of a heat exchanger at different combinations of the entry and exit temperatures of the treated and medium streams (with their directions shown). 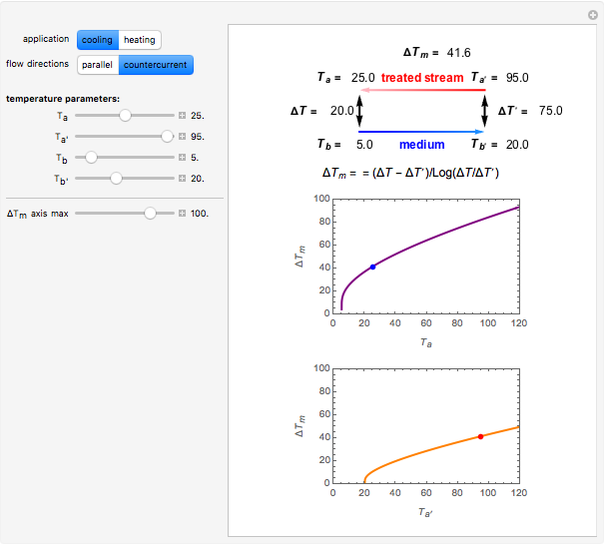 This Demonstration calculates the logarithmic mean temperature, , of a heat exchanger serving as a heater or cooler in parallel and countercurrent flows. 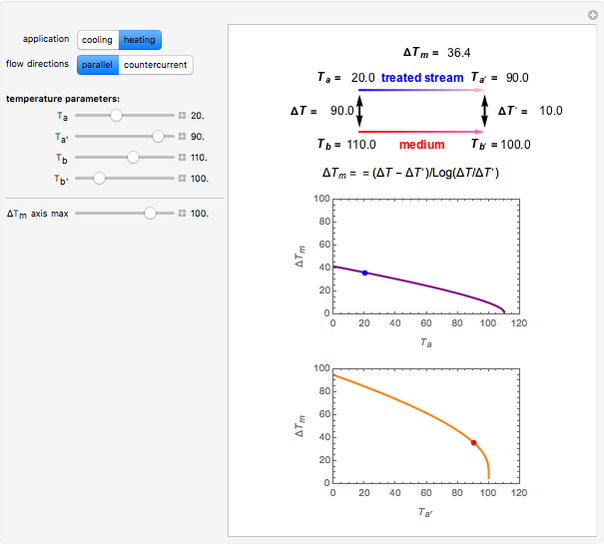 It helps the user to visualize how the streams' directions can affect the heat exchanger's efficiency. is defined as , where and are the temperature differences between the treated stream's temperature and the medium's temperature at the two ends of the heat exchanger. 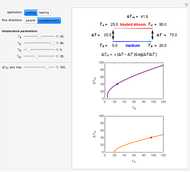 is always larger in countercurrent flows except when one stream is at a constant temperature, in which case the flow direction does not matter. In the diagram depicting the heat exchanger the treated stream is always on top. The Demonstration plots the streams' directions with the corresponding entry and exit temperatures. By clicking a selector switch you can reverse the treated stream's direction to see the effect on . Another selector switch lets you choose between cooling and heating. The Demonstration also displays separate plots of as a function of the entry and exit temperatures of the treated stream. 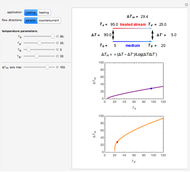 You can also use the sliders to choose the values for the entry and exit temperatures of the two streams, and and and , as well as the maximum value of the two plot axes. R. L. Earle with M. D. Earle, Unit Operations in Food Processing, NZIFST, Inc., 1983. C. J. Geankoplis, Transport Processes and Unit Operations, 2nd ed., Boston: Allyn and Bacon, 1983. 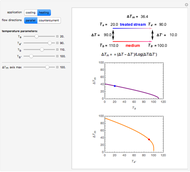 Mark D. Normand and Micha Peleg "Logarithmic Mean Temperature of a Heat Exchanger"